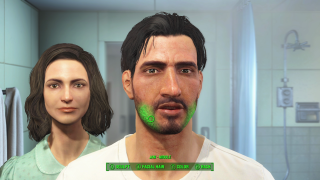 Bethesda has been pumping out videos detailing Fallout 4's S.P.E.C.I.A.L. system, but in case they're not your cup of polonium, we now also have a video that gives a broader overview of the character system. Todd Howard's dulcet tones narrate how pursuing certain character stats will open up varying perk selection avenues. There are 70 perks in total, and each has multiple levels of development that grants distinct, more powerful versions. Howard states the multiple perk levels allow for 275 options total. The big number pleases me. Even though Bethesda has received some flack for detailing a season pass price before releasing recommended system specs, videos like this help underline the amount of variability in the base game. We'll find out for ourselves once Fallout 4 releases on 11 November.